When Salman Rushdie mocked Islamic sanctities in 1989 in his magical realist novel The Satanic Verses, Ayatollah Khomeini did something shockingly original: He pronounced a death edict on Rushdie and all those connected to the production of his book. By doing this, Khomeini sought to impose Islamic mores and laws on the West; we don’t insult the prophet, he effectively said, and neither can you. That started a trend of condemning those in the West deemed anti-Islamic that persists to this day. again and again, when Westerners are perceived as denigrating Muhammad, the Koran, or Islam, Islamists demonstrate, riot and kill. Khomeini’s edict also had the unexpected side effect of empowering individuals – Western and Islamist alike – to drive their countries’ policies. On the Western side, Fleming Rose, a newspaper editor, created the greatest crisis for Denmark since World War II by publishing twelve Muhammad cartoons. Florida pastor Terry Jones caused panic for American commanders in Afghanistan by threatening to burn a Koran. Nakoula Basseley Nakoula and friends prompted a crisis in U.S. relations with Egypt with an amateurish video, Innocence of Muslims. By publishing vulgar pictures of Muhammad, French weekly Charlie Hebdo is causing the French government temporarily to shut down diplomatic missions in twenty countries. Plans by the German satirical magazine Titanic to publish attacks on Muhammad have likewise caused German missions to be closed. On the Islamist side, an individual or group took one of these perceived offenses and turned it into a reason to riot. Khomeini did this with The Satanic Verses and Ahmad Abu Laban did likewise with the Danish cartoons. Hamid Karzai goaded Afghans to riot over burned Korans by American soldiers and Egyptian preacher Khaled Abdullah turned Innocence of Muslims into an international event. In brief, any Westerner can buy a Koran for a dollar and burn it, while any Muslim with a platform can transform that act into a fighting offense. As passions rise on both sides of the democratized Western / Muslim divide, Western provocateurs and Islamist hotheads have found each other and confrontations occur with increasing frequency. 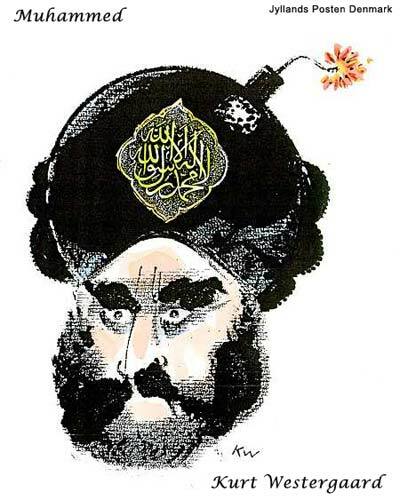 Which prompts this question: What would happen if publishers and managers of major media reached a consensus, “Enough of this intimidation, we will publish the most famous Danish Muhammad cartoon every day until the Islamists tire out and no longer riot”? What would happen if instances of Koran burning happened recurrently? Would repetition inspire institutionalization, generate ever-more outraged responses, and offer a vehicle for Islamists to ride to greater power? Or would it lead to routinization, to a wearing out of Islamists, and a realization that violence is counter-productive to their cause? I predict the latter, that a Muhammad cartoon published each day, or Koranic desecrations on a quasi-regular basis, will make it harder for Islamists to mobilize Muslim mobs. Were that the case, Westerners could once again treat Islam as they do other religions – freely, to criticize without fear. That would demonstrate to Islamists that Westerners will not capitulate, that they reject Islamic law, that they are ready to stand up for their values. Mr. Pipes (www.DanielPipes.org) is president of the Middle East Forum. This article was originally published by Fox News.